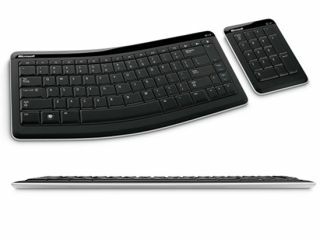 Microsoft has announced its thinnest keyboard ever, the Bluetooth Mobile Keyboard 6000. It's intended to complement the rising tide of netbooks that sport Bluetooth links but suffer from cramped, uncomfortable keyboards. Also available is a separate, portable number pad, with its own carrying case. The keyboard measures "just a few millimetres" more than a AAA battery at the back and tapers down toward the front, making it easy to pick up. Like many of Microsoft's keyboards, the 6000 uses a Comfort Curve design (of six degrees, if you're interested) for a more ergonomic typing experience compared with the straight keyboard layout of notebook computers. "The design tenets of compact, clean and refined really set the stage for the success of the keyboard," said Chris Kujawski, industrial designer for Microsoft Hardware. "There is nothing extraneous about the design. We removed everything that didn't fit with those ideas and ended up with something we're really proud of - a compact, sophisticated keyboard that pairs perfectly with Bluetooth computers." IMS Research predicts that over 55 per cent of notebook PCs will ship with Bluetooth by the end of 2010. No UK pricing has been announced yet, but the Bluetooth Mobile Keyboard 6000 will cost $90 and the Bluetooth Number Pad $45, when they hit shelves here in the US next month.